The lights are off, the floorboards creak and you sit awaiting that knock at the door, excited to see a bunch of kids dressed in bin bags, card board boxes and covered in ketchup. Of course, there is one question that we all must ask before answering that door? Will they be dressed as witches……………. If Lady Gaga does arrive at your door this evening – you should ask ‘Were you ‘Born this way?’ or ‘Is that your Poker Face?’. 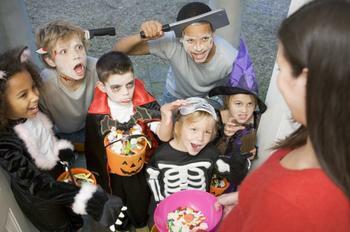 At Halloween, we answer the door to what we expect to be scary, silly & pathetic. Yet so many people in this world, refuse to answer the door to a God of love, joy, hope & purpose. It’s as if they stick up a sign that says ‘No God here!’ as they lock the door and turn away. Halloween, at it’s roots, is a celebration of evil and darkness in the world. Why waste this evening focusing on evil and make believe? Instead, look to the God of truth. Do not settle for anything less than the life God intended you to live. A life of goodness and purpose and hope! I challenge you this halloween to close the door on darkness, evil & make believe and open the door to the God of light, goodness & truth. This entry was posted in Uncategorized and tagged aith, blogger, christian, Church, churchf, creative communicator, darkness, door, evangelism, evangelist, Evil, faith, ghost, God, halloween, laughing with tom, Life, scared, scary, skelleton, tom elliott, zombie. Bookmark the permalink.